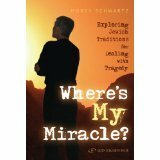 Schwartz examines the many answers that Jewish sages offered to the age-old question, “Why do bad things happen to good people?” He writes in easily understandable English with full, but not overfull documentation. He doesn’t impose his own view, leaving readers the choice between the many solutions that he explains. The following are some of the views. Many people are sure that God is in control; he even decides when every leaf or snow flake will fall and exactly where it will land. Everything God does is for the best. He watches over every person like a loving father. True, we don’t know why he sometimes inflicts us with pain and we will never know. But we know one thing, he does no wrong. To doubt this, these people say, is heresy. This view is in a Mishnah and a Midrash, but as we will see, other views are also in other Midrashim and Mishnahs as well as other ancient Jewish texts. Like Jews today, the ancients, even great sages, differed in how they responded to this ancient question. Another large group accepts the basic premise of the former that God manages the world, but claim that they do know why the loving God makes them suffer. The adversity is deserved. It is because of sin. One opinion in the Talmud puts it this way. “The righteous one who prospers is a perfectly righteous person; the righteous one who suffers is not a perfectly righteous person. The wicked one who prospers is not a perfectly wicked person; the wicked one who suffers is a perfectly wicked person.” People get what they deserve; God would not do otherwise. Then there is an opinion in another Midrash that contends that the biblical patriarch Isaac was the first human who was tormented. He prayed to God to inflict him and all future humanity with the “gift” of pain so that their misery would give atonement for past wrongs that he and others committed. Thus, “bad” is a blessing. A twist on the atonement idea, in still another Midrash, is the notion is that the righteous, although they do not deserve it, suffer to atone for others. This idea was taken from Christianity. There are many other ideas. Some sages say that God may cause a person to die because of love for that person, to protect him from corruption that lies ahead. Others, who believe in reincarnation, claim that people suffer in this life to atone for bad deeds committed in a previous life. The modern rabbi Harold Kushner claims that evil occurs because God lacks the power to prevent it. Another modern rabbi writes that God has the power to stop bad things from happening, but has chosen not to do so; if he intervenes, his help would infringe upon people’s free will. Others moderns suggest other reasons why God, who in their view occasionally helps people, sometimes “sits back” and decides not to do so. But there were others who dispute the basic premise. They contend that not all suffering comes from God. The Talmud, for instance, reports that the third century sage Rava argues that all of life is determined by planetary influences, astrology. Schwartz ends his book with a quote from Maimonides. “In every disagreement between sages, where there are no practical ramifications, rather it is only a matter of belief, then there is no need to decide according to one of them.” In a word, the sages disagreed in why we suffer, we can accept any of their views, or reject them all and believe as we choose.